Olympia, site of the famous Temple of Zeus and original venue of the Olympic Games in ancient Greece, was presumably destroyed by repeated tsunamis that travelled considerable distances inland, and not by earthquake and river floods as has been assumed to date. Evidence in support of this new theory on the virtual disappearance of the ancient cult site on the Peloponnesian peninsula comes from Professor Dr. Andreas Vött of the Institute of Geography of Johannes Gutenberg University Mainz, Germany. Vött investigated the site as part of a project in which he and his team are studying the paleotsunamis that occurred along the coastlines of the eastern Mediterranean over the last 11,000 years. According to his account, the geomorphological and sedimentological findings in the area document that Olympia and its environs were destroyed by tsunami impact. The site of Olympia, rediscovered only some 250 years ago, was buried under a massive layer of sand and other deposits that is up to 8 meters deep. Both the composition and thickness of the sediments we find in Olympia do not go with the hydraulic potential of the Kladeos River and the geomorphological inventory of the valley. It is highly unlikely that this could have been the work of this creek," states Vött. 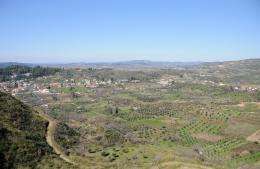 To date, it has been assumed that the cult site was finally destroyed by an earthquake in 551 AD and later covered by flood deposits of the Kladeos River. In this scenario, however, it remains mysterious how the tiny Kladeos that passes by could first have buried Olympia under several meters of sediment, only to subsequently get incised by 10 to 12 meters down to the flow level used in ancient times. Working in collaboration with the local Ephorate for Classical Antiquities, the German Archaeological Institute, and colleagues from the universities of Aachen, Darmstadt, Freiburg, Hamburg, and Cologne, Vött and his team examined the location using geomorphological and geoarcheological methods and techniques. "In earlier times, Olympia was not 22 kilometers away from the sea as it is today. Back then, the coastline was located eight or perhaps even more kilometers further inland," explains Vött. In his scenario, tsunamis came in from the sea and rushed into the narrow Alpheios River valley, into which the Kladeos River flows, forcing their way over the saddles behind which Olympia is located. The cult site was thus flooded. Vött assumes that the flooding decreased only slowly because the outflow of the Kladeos through the Alpheios valley was blocked by incoming tsunami waters and corresponding deposits. The analysis of the various layers of sediments in the Olympia area suggests that this scenario came true on several occasions during the last 7,000 years. It was during one of the more recent of these events in the 6th century AD that Olympia was finally destroyed and buried. The Olympia tsunami hypothesis is further supported by the fact that high-energy sediments of undoubtedly tsunamigenic origin were found on the seaward side of the hill range and these deposits are identical to those in Olympia itself. Vött points out that "the sediments around Olmypia have the same signature as the tsunamite in the lower Alpheios valley." Vött says that the cause of Olympia's destruction could not have been an earthquake because in this case the fallen fragments of the columns of the Temple of Zeus would directly lie on top of each other, but in fact they are "floating" in sediment. All the sedimentological, geochemical, geomorphological, and geoarcheological findings obtained by the study support the new and sensational hypothesis that Olympia was destroyed by tsunamis. Detailed analyses of associations, origin, and age of microfauna as well as geochronological studies are currently in progress. Results are expected soon. Tsunamis are well known from the eastern Mediterranean and are mainly the result of extensive seismic activities along the Hellenic Arc. Here, the African plate is being subducted by the Eurasian plate, repeatedly triggering major earthquakes that are followed by tsunamis. The most recent mega-tsunami in the Mediterranean occurred in 1908 related to an earthquake in the Straits of Messina in southern Italy, devastating the neighboring coastal region, more than 100,000 people were killed. A 30 meter-high tsunami wave was recorded in the southern Aegean in 1956. "The evaluation of historical accounts has shown that in western Greece there is one tsunami every eight to eleven years on average," specifies Vött.